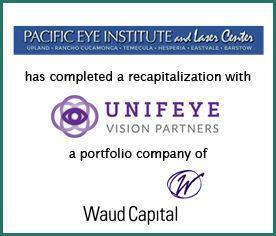 Pacific Eye Institute (“PEI”) completed a recapitalization with Unifeye Vision Partners (“UVP”), a portfolio company of Waud Capital Partners. PEI is a leading provider of vision care services within the Inland Empire of Southern California, operating across six clinical locations and one ambulatory surgery center. Founded over 30 years ago by Dr. Bob Fabricant, PEI has grown into a distinguished team of 17 ophthalmologists and six optometrists. Provident Healthcare Partners (“Provident”) served as exclusive financial advisor to Pacific Eye Institute. The terms of the transaction were not disclosed. Founded in 1981, PEI is a comprehensive ophthalmic care provider in the Inland Empire with locations serving Rancho Cucamonga, Victorville, Temecula, Eastvale, and Upland. This includes “The Ambulatory Surgery Center”, a modern 9,200 square foot facility with two state-of-the-art surgical suites and a laser center. These facilities provide the highest quality vision care for the treatment of ocular conditions in a comfortable outpatient environment. For more information, visit www.pacificeyelaser.com. Provident is the leading investment banking firm specializing in merger and acquisition advisory, strategic planning, and capital formation for healthcare companies. The firm has a comprehensive knowledge of market sectors and specialties, and unsurpassed experience and insight into the M&A process. For more information, visit www.providenthp.com.